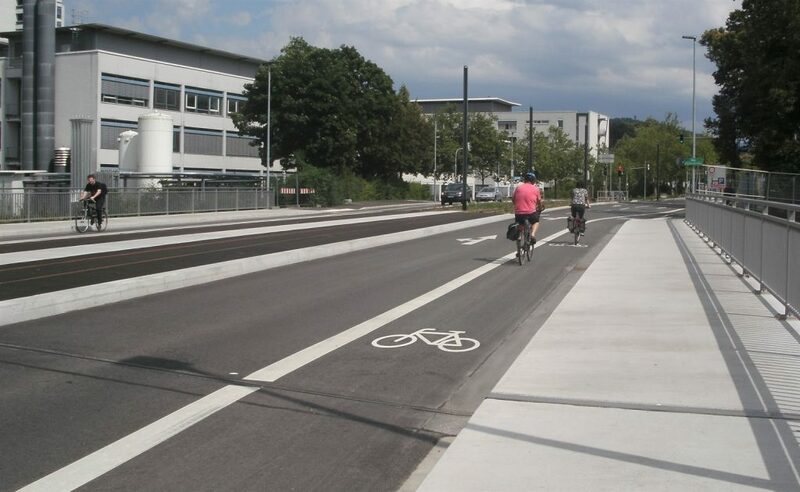 We’ve seen a lot of examples of cities around Europe that are doing great things for cycling. 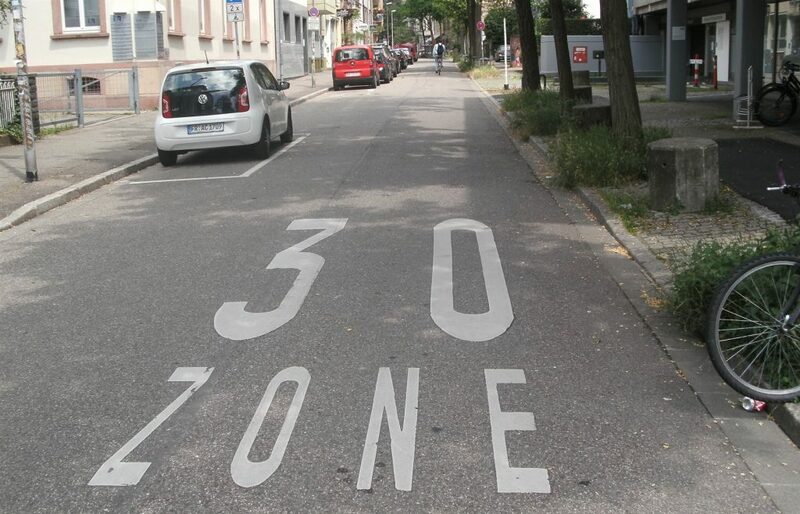 But our local readers might say “You’ve shown us big cities (e.g. 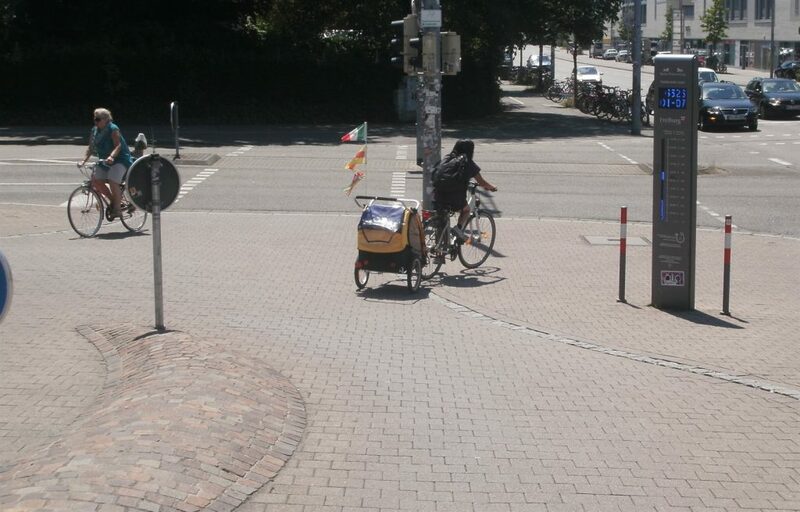 Munich, Vienna, London), small cities (e.g. Enschede, Houten), and hilly cities (e.g. 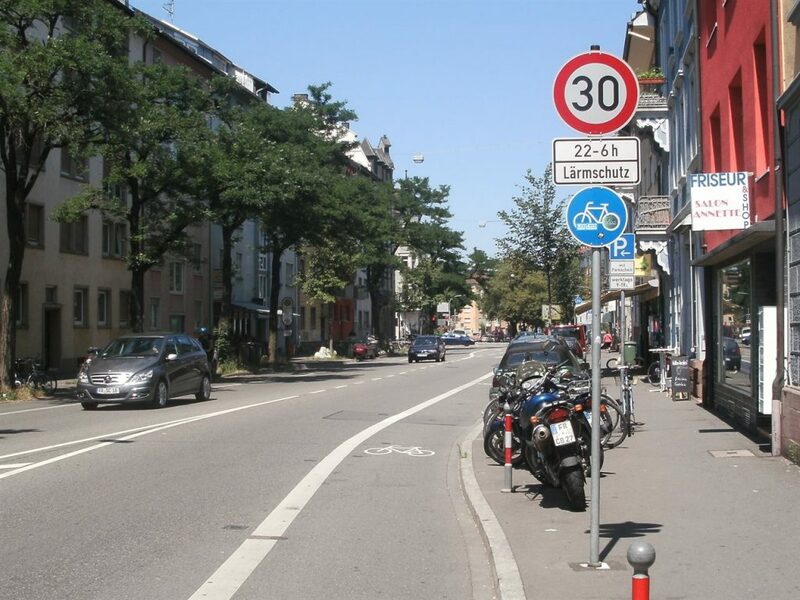 Bristol, Zurich); how are they really relevant to Christchurch?” To which I would reply: Freiburg. 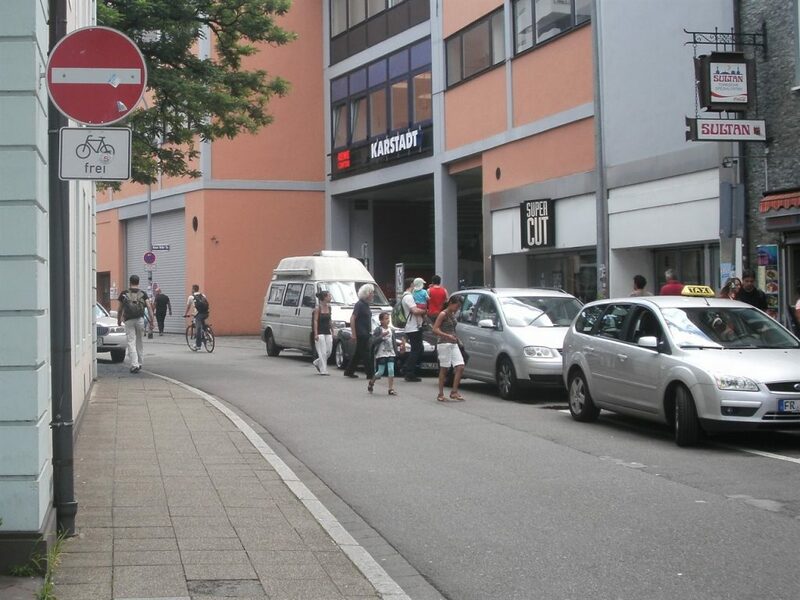 The German city of Freiburg im Breisgau in the southwest of the country has a population of only 230,000, although the surrounding greater metropolitan area encompasses about 550,000 people. 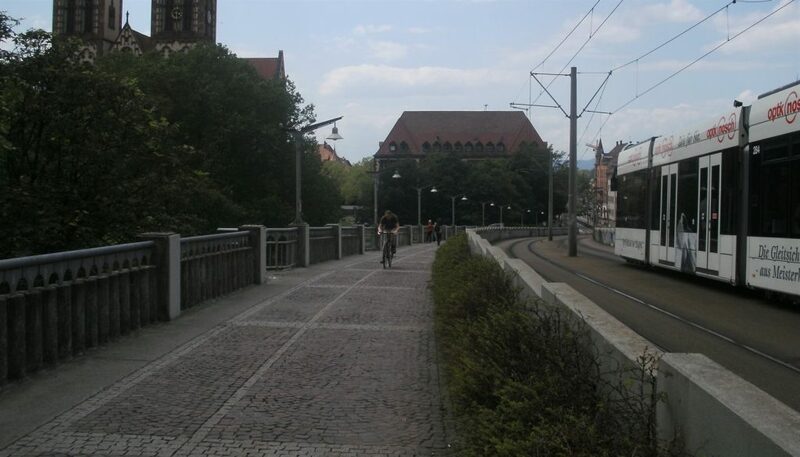 Nestled between the foothills of the Black Forest and the Rhine River valley, Freiburg has a relatively flat topography. 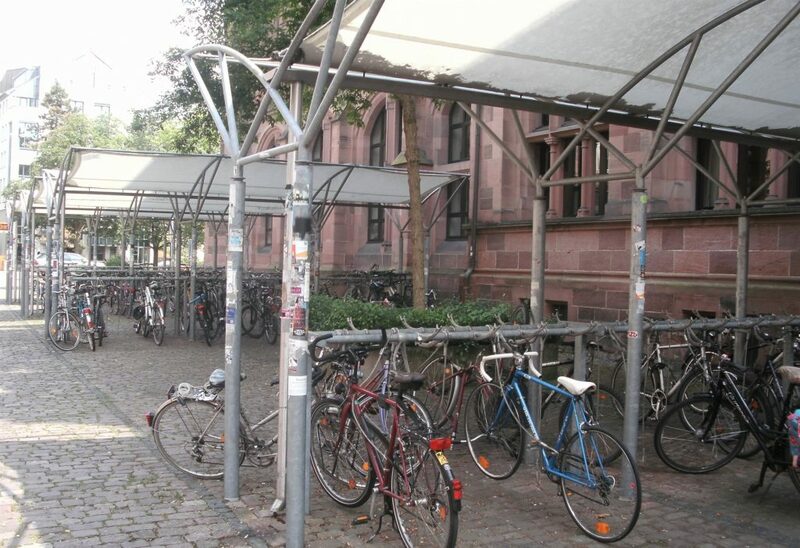 Freiburg has been a stronghold of the Green movement since the early 1970s and thus there has been a strong pro-sustainability push by successive councils there in terms of energy, waste, land use, and of course transport. 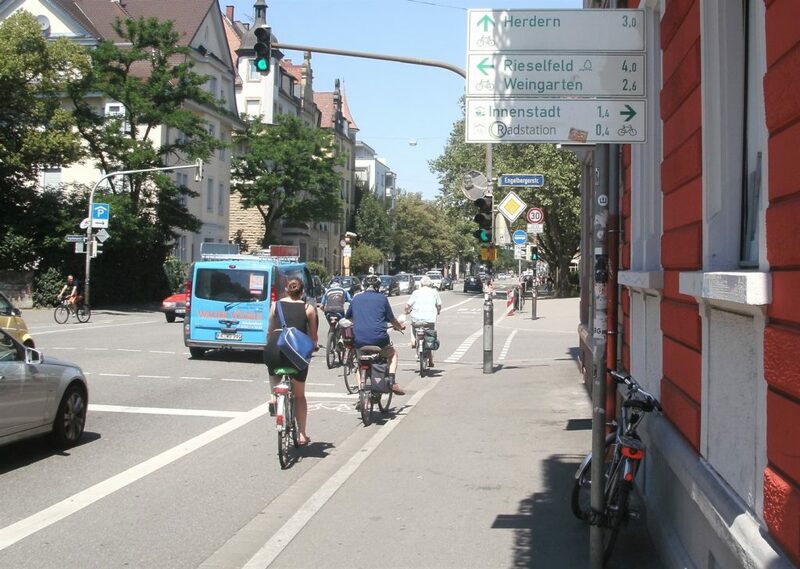 This includes an extensive city tram network that continues to be expanded (currently over 30km), a 30km/h urban area, and a comprehensive network of over 400km of cycling routes. 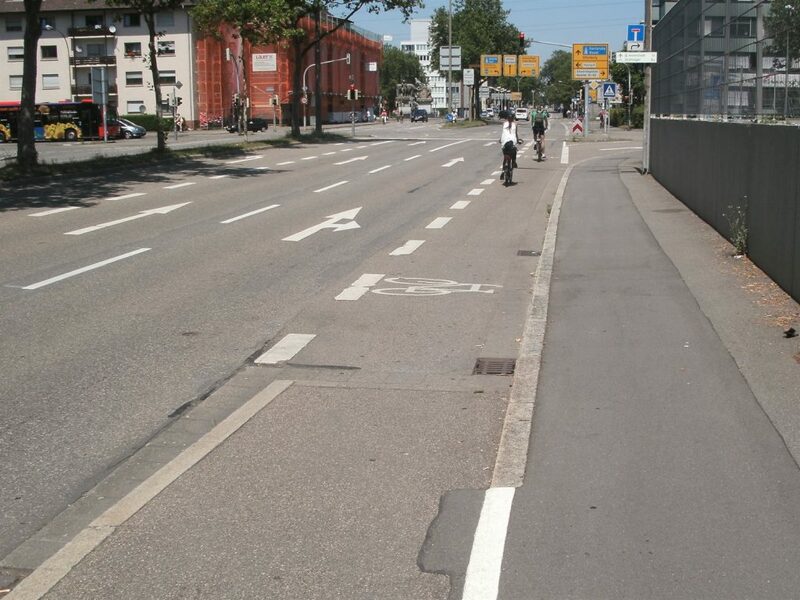 All this has led to a cycling modal split of over 25%, and only about 30% of trips being driven. 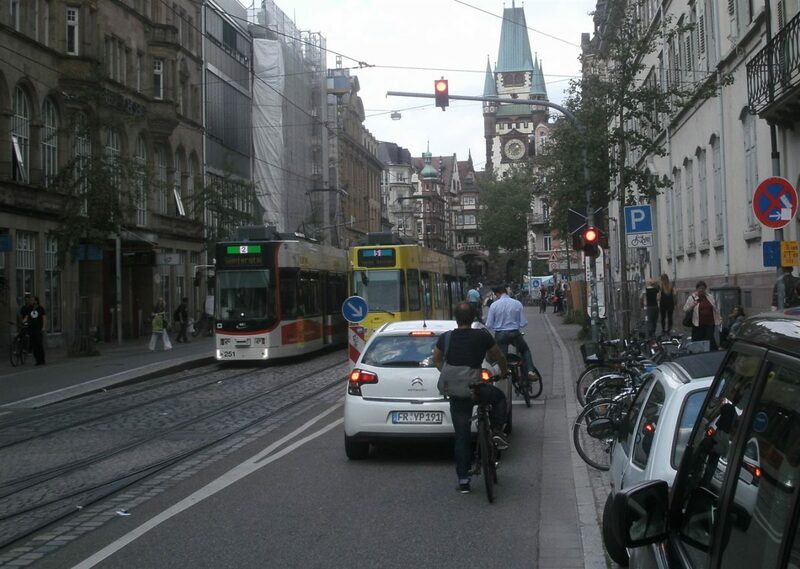 The city uses many of the same transport strategies that we’ve seen elsewhere in Europe. 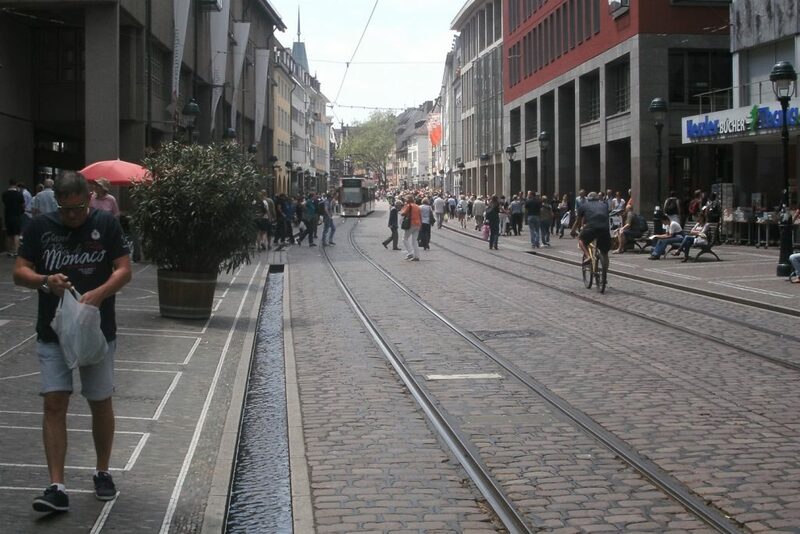 For example, the central city is restricted at times for motor vehicles (especially delivery trucks), allowing trams and people walking/biking easy movement. 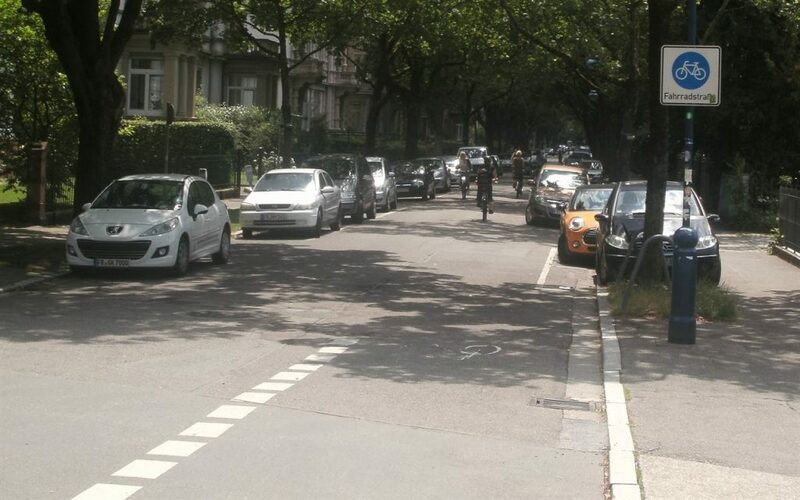 Elsewhere, various street restrictions make it hard to drive around, whilst still allowing easy biking access. 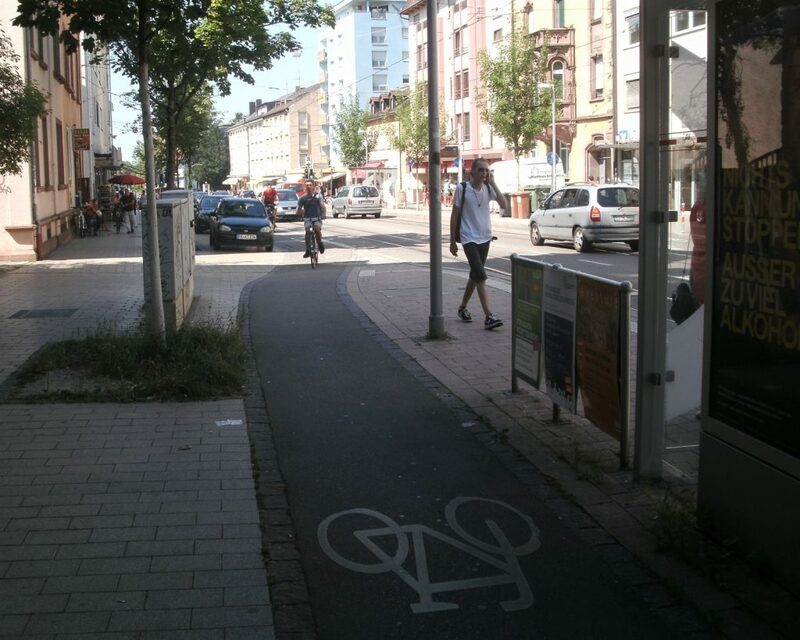 “Bicycle-friendly streets” (fahrradstrasse) also get used in Freiburg as well, where other traffic has to yield right of way to bikes (or, in the case of some bridges/underpasses, may be completely prohibited altogether). 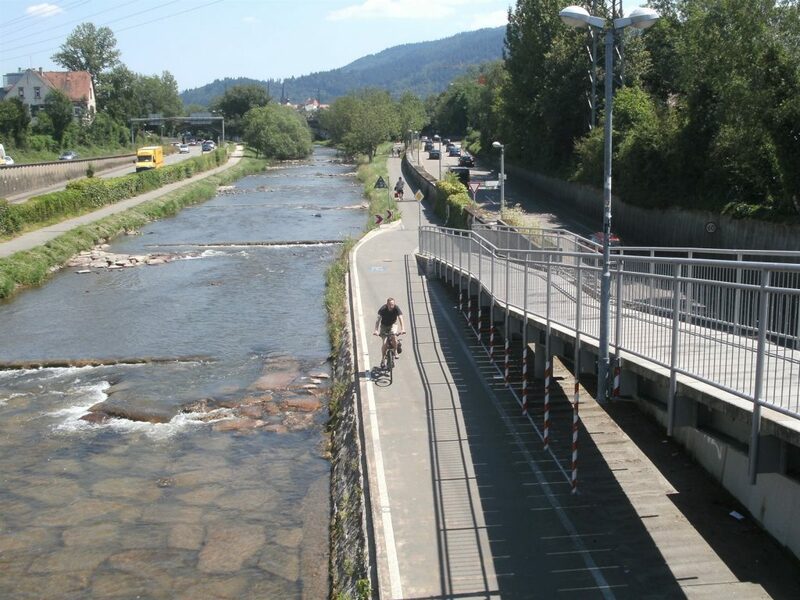 The main traffic route in Freiburg is away from the central city, following the Dreisam River. 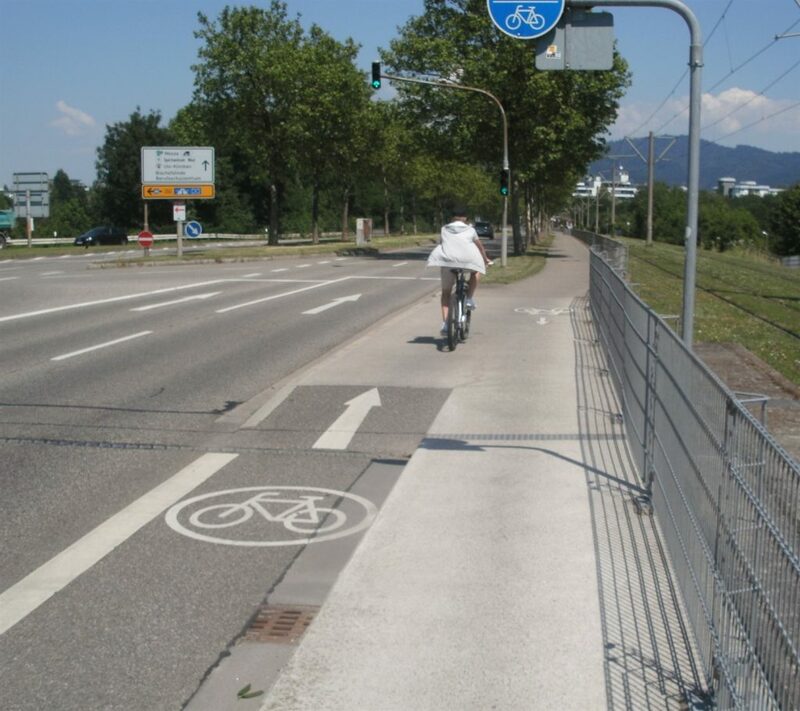 Along this corridor, the “FR-1” cycleway also provides a 10km grade-separated cycling route with only one point where bikes have to stop for traffic. 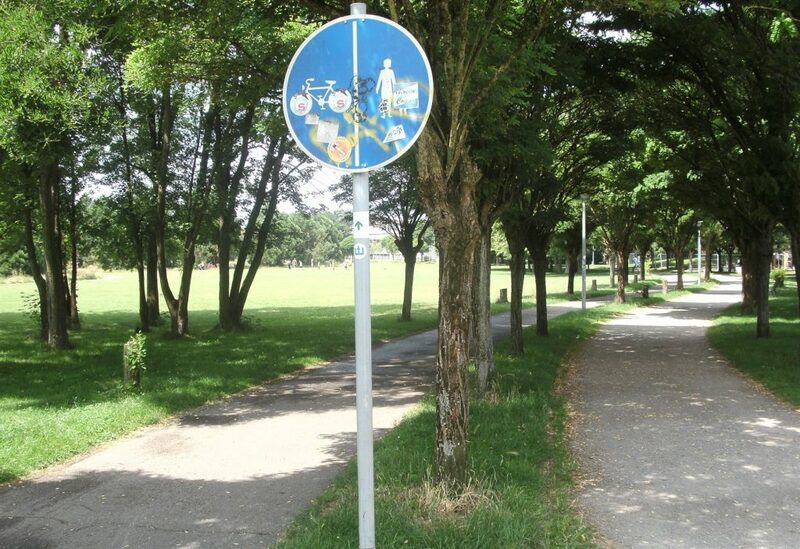 The interaction between public transport and bikes has also been thought out. 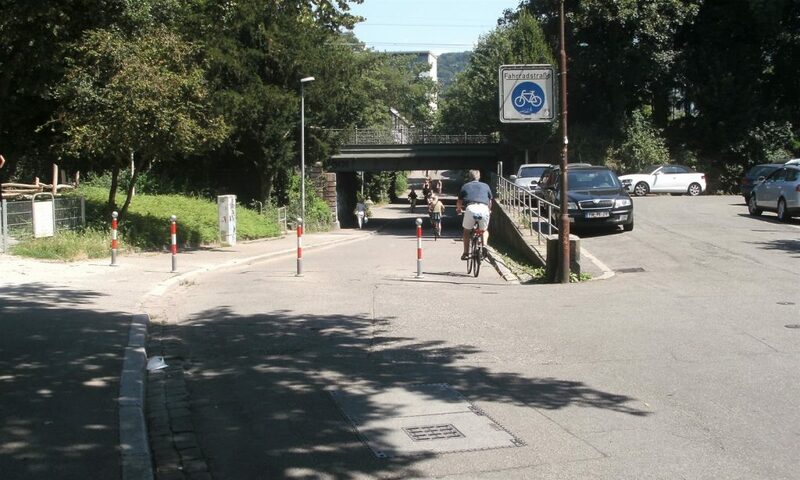 For example, a cycleway might be re-routed behind a tram stop to avoid conflicts. 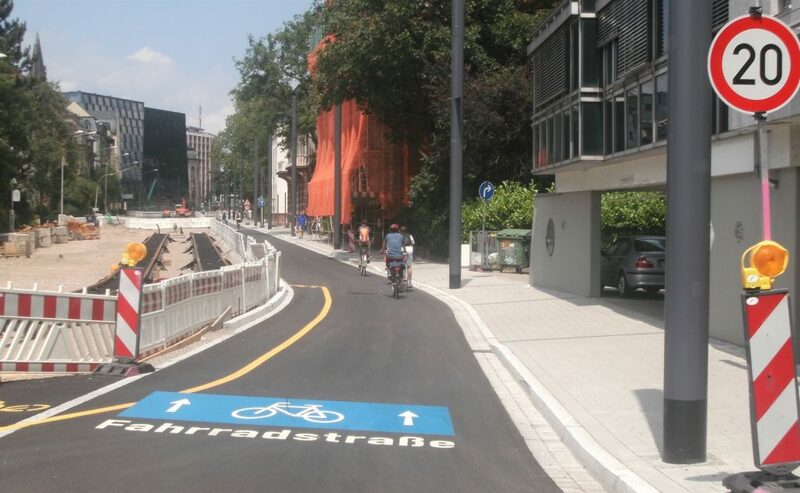 As streets are reconstructed to include new tram routes, invariably there is also provision for cycling along these corridors too. 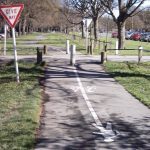 Interestingly, in talking to a colleague at the City Council, there is a current policy of shifting some of the off-road shared facilities alongside busy roads to on-road cycle lanes. 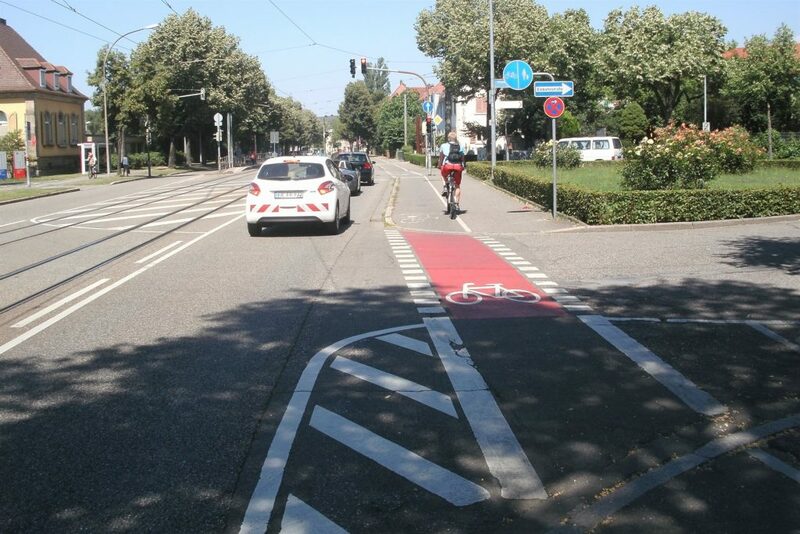 The thinking seems to be to minimise the crashes at intersections, where cyclists may not be so visible when set further back (a similar approach is used in many cases in Copenhagen). 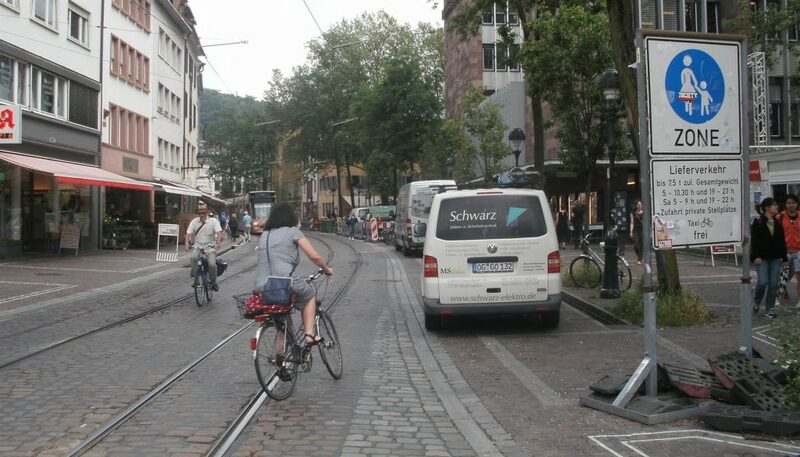 It will be interesting to see how this approach affects both the safety and usage of cycling in Freiburg. 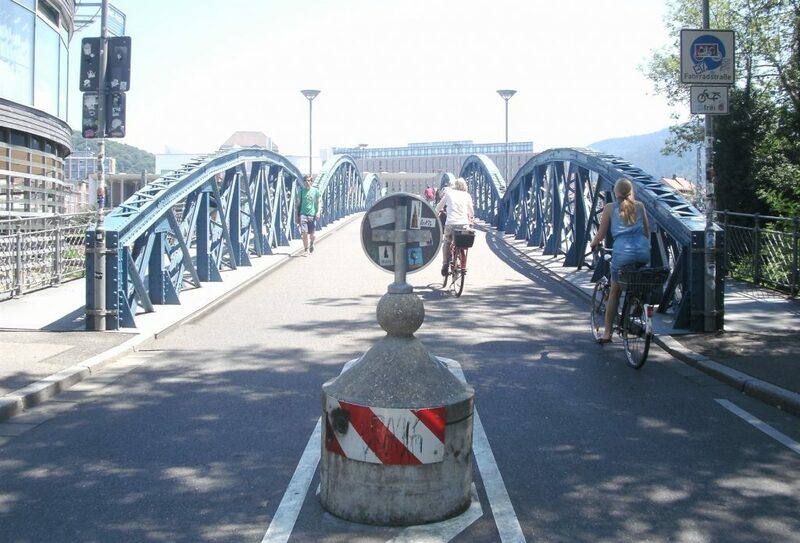 Freiburg has demonstrated that, with the right political will, a mid-size city (not unlike Christchurch) can be very successful at limiting the influence of motor traffic in the urban area, while providing viable public transport and active transport alternatives. Can Christchurch follow Freiburg’s lead?